Plymouth & Cornwall Wing have held Sunday Services to mark the anniversary of the establishment of the Air Training Corps on 5th February 1941 when it received the Royal Warrant from King George VI. The origins of the ATC stem back to 1859 in the formation of several units at schools of armed adults and older boys with the purpose to protect Britain from an attack. While being renamed a couple of times including Officer Training Corps and the Air Defence Cadet Corps (ADCC) it was the vision of Air Commodore Sir John Adrian Chamier CB, CMG, DSO, OBE who saw the need to encourage young men into aviation to prepare them to join the Royal Air Force. After the Government took control of the ADCC in late 1940 the Royal Warrant was issued a couple of months later to rename the organisation the Air Training Corps. 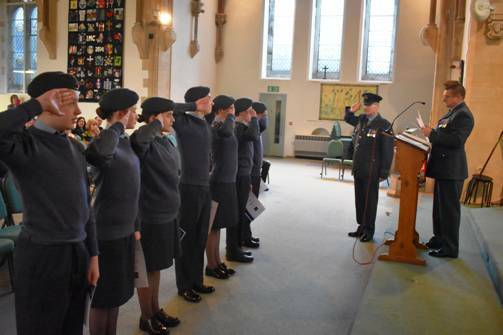 One of the services was held by 339 (South Dartmoor) Squadron at Ivybridge Methodist Church, attended by staff of a number of squadrons, cadets, parents and Officer Commanding of Plymouth & Cornwall Wing, Wing Commander Francis Reis. 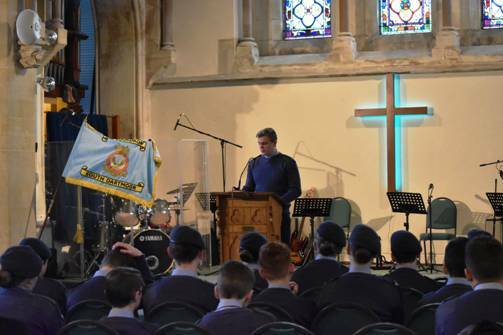 During the service which, was opened by the Squadron Chaplain Reverend Mark Lawrence, Cadet Olivia Pillans, 14, read a poem, aptly named High Flight before Cadet Alice Ayres, 16, give a presentation on her experience of being a cadet. The commanding officer of 339 Squadron, Flight Lieutenant Adrian Corfield, gave an address on the history of the formation of the Air Cadet Organisation and the many achievements of the cadets before inviting Wing Commander Reis to present certificates for exams, first aid and Duke of Edinburgh Awards to the cadets. On recommendation to the Wing Commander Cadets Tori Kohler,15, and Leon Harris, 16, were promoted to the rank of Cadet Corporal. After an address by Wing Commander Reis, Cadet Sergeant Peter Bull, 18, read a reading from Ephesians. The service was closed with a blessing from the Wing Chaplain, Prebendary Brian Anderson. Squadron Commander, Flight Lieutenant Corfield said, "During the past 12 months cadets have not only taken part in many activities ranging from flying in light aircraft to adventure training weeks but also achieved many qualifications equipping them with skills for inside and outside of the RAF Air Cadets".